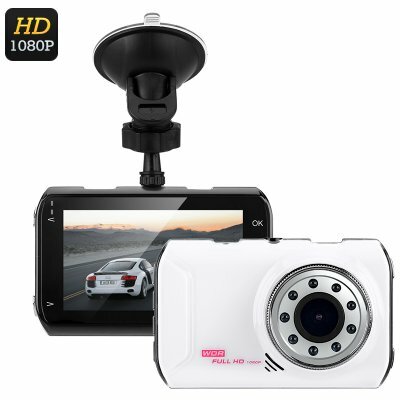 Successfully Added Full-HD Car DVR System - 170-Degree Viewing Angle, 1/4-Inch CMOS Sensor, 1080p, 24FPS, 2.7 Inch Display, G-Sensor (White) to your Shopping Cart. Whether you simply use it to capture the beautiful scenery during your upcoming road trips, or to significantly increase your safety on the road and to capture video evidence of potential unfortunate future accidents – this full HD car DVR kit is there to meet your needs. Equipped with a 170-degree wide-angle lens, this car black box records everything that happens in front of your car. Not only will you be able to capture full HD and highly detailed images of the road in front of you but, thanks to its wide-angle lens, this camera will also record that what’s happening next to the road – giving you a clear overview of the entire situation and everything that happened around your vehicle while watching back the recordings. From now on everything that happens around your car will be captured in stunning detail as nothing escapes the view of this car DVR camera. Packing a powerful 1/4-Inch CMOS sensor, this dash cam records everything in stunning beauty and detail – ensuring that even the slightest details and smallest objects will be clearly visible on your upcoming recordings. By recording footage at 24FPS it allows you to shoot highly detailed and clear images of that what’s happening on the road even while driving high speeds. Besides shooting 1080p footage, this dash cam is also capable of capturing stunning 12MP pictures. Supporting motion detection, your car black box can be programmed in such manner that it will snap highly detailed images whenever motion is detected, ensuring that you’ll always have the picture evidence needed in case something happens to your car. Featuring a highly advanced G-sensor, this 1080p dash camera will automatically save your recordings at the moment of impact, ensuring that not a single moment of evidence gets lost in the moments following this unfortunate event. Supporting 32GB memory, this car DVR offers plenty of space for you to securely store hour’s worth of footage recorded during your upcoming road trips. Additionally, for those who do not like to fill up their storage too rapidly, this dash cam also comes with a cycle recording feature. When enabled, this feature records all that happens around your car for 3, 5, or 10 minutes before overwriting the previous loop recording – ensuring that your memory will not get filled up with one long recording that may last for hours. Besides the dash camera itself, this car DVR kit also comes with a 2.7-Inch LCD display that allows you to easily navigate through its functions and set the right features. Additionally, this beautiful FHD display also allows you to watch back any of your recordings instantly at the side of the road – letting you settle minor roadside disputes instantly without the need of arguing about what really happened. From now on you’ll always be able to record everything happening around your car in stunning beauty and detail and never get confronted by false insurance claims again as this FHD car DVR player is always there to provide you with the evidence needed. This car DVR system comes with a 12 months warranty, brought to you by the leader in electronic devices as well as wholesale electronic gadgets..